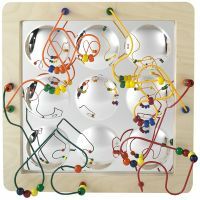 The Mirror Sculpture Maze Panel is introductory physics portrayed in a fun and entertaining toy! With legs intertwining in unique directions over spherical mirrors, kids will enjoy pushing and pulling the colorful round balls over and under them, while simultaneously experiencing images changing size. So encourage your child to strengthen their color recognition by participating in imaginative play with the Mirror Sculpture Maze Panel. Ages 2+.